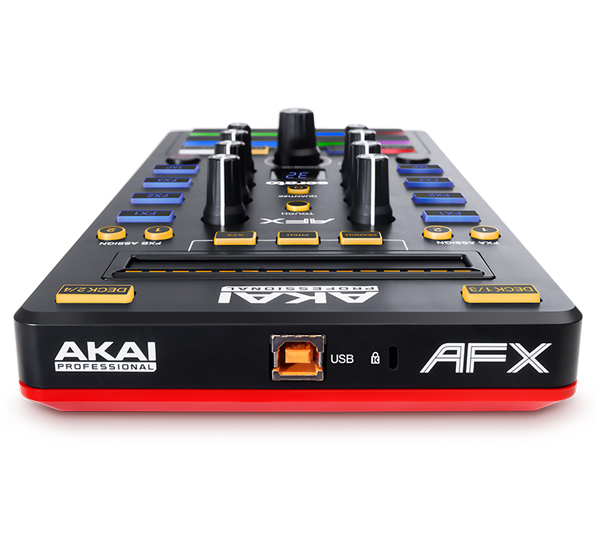 Expand your creative performance capability with AFX, a versatile 4-deck FX controller for advanced performance using Serato DJ, a powerful software platform for digital DJ'ing. A single USB connection adds over 70 intuitive controls to your DJ setup including intelligent touch-activated knobs, velocity-sensitive pads and backlit buttons. 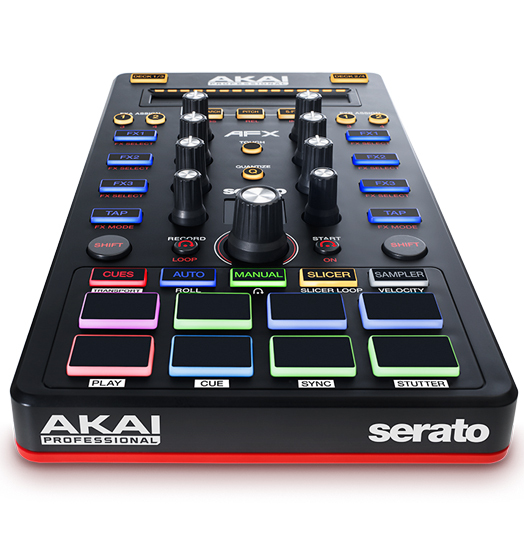 Trigger samples, assign loops and cue points, tweak Serato effects (known as FX), manage DVS modes, automate song edits, and so much more from ultra-responsive, trusted Akai Professional hardware found in studios and stages all over the world. Read on to see what it can bring to your next live performance using Serato DJ. 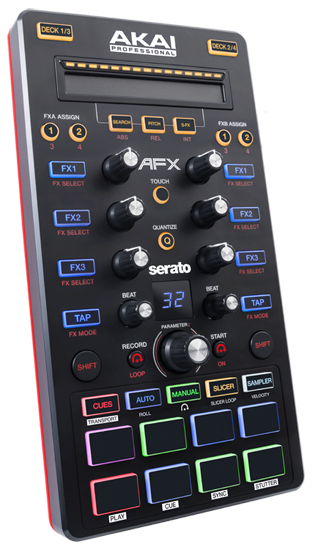 AFX gives you exhaustive control over the iZotope FX inside Serato DJ. Just plug it in to expand or add controls to any Serato setup. A total of 9 touch-activated knobs unlock all-new FX capabilities – planned or improvised. Assign FX on the fly, tweak their parameters, and layer FX types with tactile, responsive control that incorporates a dramatic "twist"– knobs that react to the human touch. In Touch mode, each knob responds to a twist, a touch, or a combination of both. A rotary-push knob and corresponding backlit LCD screen provides easy parameter adjustment and confirmation. For DJs adding FX controls to a Serato NoiseMAP™ setup (timecode vinyl), AFX even provides DVS-mode switching, keeping your interaction with the computer trackpad or mouse at a minimum. 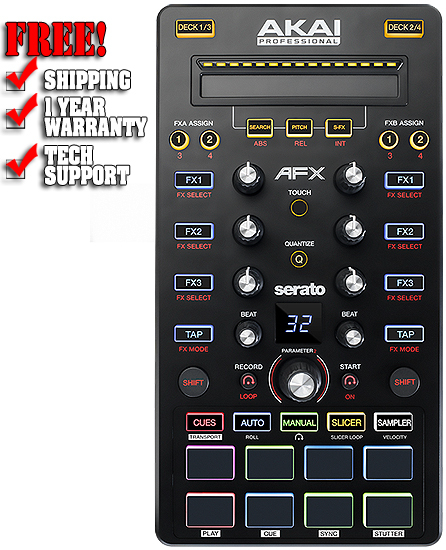 AFX has deep integration with Serato DJ's Flip Expansion Pack. Flip allows you to record your cue point and censor actions which can be saved and looped, ready to re-trigger and start in an instant. Use Serato Flip to create and save up to 6 Flips per track, ready for playback in the studio or the club. Flip can be used to create and play back custom song edits ranging from extended intros/outtros, breakdowns, making beats, skipping verses or choruses, and creating clean edits of songs. Even more, AFX includes Serato's Backpack FX Expansion pack to give your sets a boost using a dub collection of analog-style effects – echo's, loopers, filters, and time stretch.